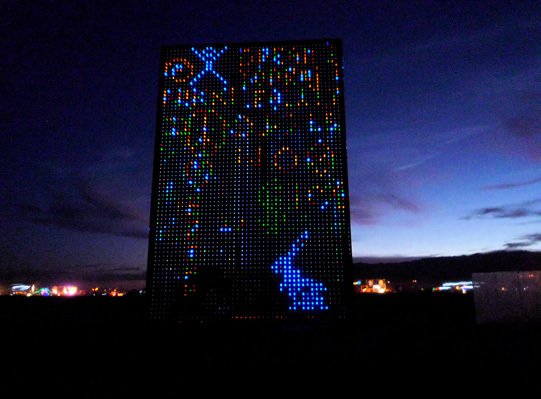 Über Lite-Brite is an interactive, collaborative light sculpture for visual conversation and self-expression. Anyone can interact with the sculpture by adding or rearranging colorful UV-reactive plastic pegs on the black light back-lit surface. With more than 13,000 peg holes spanning 96 ft2 over 4 sides, Über Lite-Brite creates a large community space for creativity by accommodating more than a dozen interactions at once. The sculpture evolves as participants temporarily claim ownership over sections of the finite canvas, in the process selecting which previous efforts to destroy and which to preserve. Lighted text, images, and abstract shapes emerge and disappear, overlap and overlay, ebb and flow, until nothing but memories and photographs exist of the ephemeral experience.